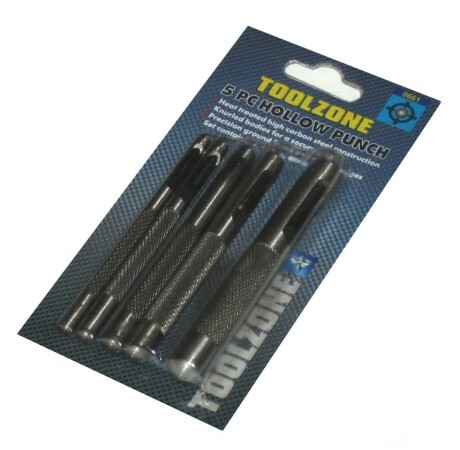 Excellent set of 5 hollow punches from Toolzone Tools. These hollow punches are made from heat treated high carbon steel construction. Knurled bodies for a secure grip. Precision ground flutes and cutting edges. Set contains: 3, 4, 5, 6 and 8mm hollow punches. Length: ranges from 80 - 85mm approximately. Superb quality and value from Toolzone Tools.